What are the effects of the opioid crisis in Flagler County? The most comprehensive answer to date was presented this morning in a 95-minute set of presentations and discussions before Flagler County’s Public Safety Coordinating Council. The panel gathers judges, law enforcement chiefs and prosecutors, the public defender, local government officials and social service agency heads most months to take stock, detect trends and recommend initiatives. Mental health and the opioid crisis are atop the group’s agenda this year. This morning’s discussion on opioids was stark and dispiriting but not hopeless. The means to address the crisis are no mystery and are, in various ways, within grasp. But the money necessary to tackle the problem more broadly is lacking, as are the facilities, the beds, the personnel required to make any treatment and recovery effort stick. Missing too is the coordination necessary between agencies to know how one addict is making it through what amounts to the maze of a system that works more effectively in its component parts to police an individual’s behavior than to help and treat an individual through the sum of those parts. In other words, the police do what they can to arrest the addict or drug pusher, a judge will confine the person to jail, if a bed is available a treatment center or a slot opens in Drug Court that might work for the addict for a while, the probation office will keep tabs and return that person to jail if necessary, and the Department of Children and Families might remove a child from that person’s home if the crisis has reached a critical point. Yet each of those agencies operate in autonomous silos that turn individuals into billiard balls knocked about this way and that depending on their ability to abide by their responsibility to recover. Addiction by definition degrades that sense of responsibility, shifting much of the burden to shepherd the individual back to those agencies. And that’s when agencies’ jurisdictions or means get fuzzy, the effort fragments, and addicts pay the price by recycling through instead of sticking with recovery. In a sense, the profile of the Public Safety Coordinating Council is a reflection of both the strength of local agencies, police and the judiciary individually: these discussions and hunger for new and workable initiatives would not take place but for the genuine desire among council participants to achieve a breakthrough in the fight on opioids. But the same panel, through no fault of its participants, also reflects the inherent weakness in the way the system as a whole forces them into more fragmentary than holistic roles. Today’s discussions provided an unfiltered factual and analytical perspective on opioids’ effects locally from many voices that usually operate behind the scenes or from positions less prone to public pronouncements–whether judges, jail, and probation officials, top cops or social service agencies such as the Department of Children and Families and Stewart-Marchman Behavioral Health. As a group they never meet together except through the coordinating council, and as agencies they are at times barred from sharing information by privacy and regulatory constraints, which was actually one of the concerns discussed today, as it limits the agencies’ effectiveness in following through with certain patients, or anticipating their next relapse. The meeting, in sum, was a unique window into a devastatingly common problem that in 2016 alone totaled 5,725 opioid-related deaths in Florida. More than 1,000 of those deaths were attributed at least in part to heroin overdoses. “I can tell you, I’ve been doing it for a year now, and I can tell that and I don’t know if it’s the opioid crisis but we seem to be getting busier and busier. In Drug Court, we reached capacity. When I first started last year, we graduated a handful of people when I first got here, and we had 18 people. Well, we just reached capacity the other day, so we’re up to 42, and have some people that are interested in coming in but of course they’ll have to wait. Since we were talking about in-patient space and waiting lists and that kind of thing, I can let you know: my choices are kind of limited. We have quite a few people in Drug Court, not so much on probation but in Drug Court, that basically are being held in custody until bed spaces are available. I’ve had a few of them in there for quite a few months. Even when we don’t have the bed space, there’s a cost to the community because we’re holding them for, in some cases, several months before they get there.” He said those waiting in jail are high-risk individuals who would relapse otherwise. Lower-risk individuals are allowed to wait out of jail. Beyond Drug Court, the treatment bed space issue is a broader concern. Put simply, there are no treatment beds for men in Flagler County. Stewart-Marchman has some 75 beds at the Vince Carter Sanctuary in Bunnell, where it runs Project Warm. (It’s licensed for 88 beds, but the facility has space for only 75.) But that’s exclusively for women, and they’re not cheap: treatment there costs $425 a day. The Department of Children and Families may subsidize a bed, providing up to $188 a day, and client cost may end up being as little as $21 a day, depending on her financial condition and insurance capabilities, but it could also be $425 a day. Besides, it’s full: Project Warm has a three-month waiting list. “We get phone calls and families begging to get their family members into the program,” says Stewart Marchman’s Alicia Vincent. They end up having to wait for an opening. Stewart-Marchman has a five-county service area that extends to Duval, St. Johns, Putnam and Volusia. Between Duival and Volusia there are upwards of 400 beds, some of which end up being occupied by Flagler residents depending on availability and classification. But choices for judges, deputies and social service agencies that refer individuals to treatment are limited by capacity. Nevertheless, Pastor Charles Silano, who runs the Tabernacle Grace Food Pantry and a six-bed recovery house for addicts in Bunnell, with a second house nearing its opening, for women, has been working with some inmates at the jail to prepare them for a transition to recovery beyond it. “What we need is more recovery houses. 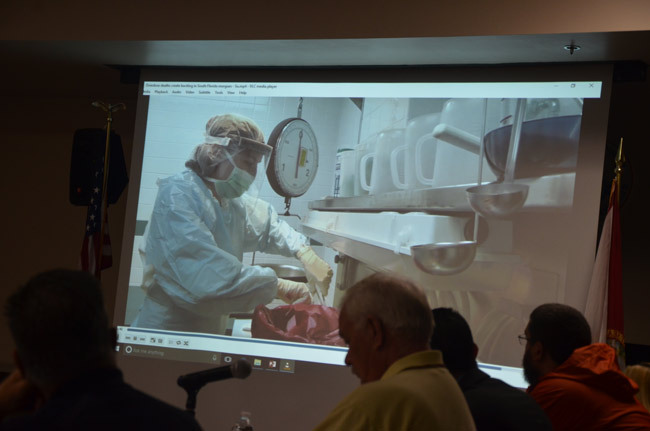 They are held accountable there, they are processed back into the community,” Silano said, specifying that in recovery houses, there’s no medical treatment. It’s all based on the will of the addict to get over the addiction, learn sobriety skills, learn job skills, apply them, and stick with them. There’s a strong religious component to the process that Silano refrained from talking about, though he candidly spoke about the “corruption” those houses may be prone to, and that must be guarded against. “We need long term recovery as opposed to one month in. One month in really doesn’t do anything. It’s a start. We need detox facilities. But we need long-term care,” He proposed a Silano continued, seeing recovery houses as such long-term care. He was echoed by another provider of such houses, John Lowe, who runs several houses as the Hearthstone Fellowship Foundation in Daytona Beach. Those recovery houses are licensed by the Department of Children and Families. “So there’s a lot of things I think that we have at our fingertips if we could perhaps make our way to using them properly,” Silano said. And then, in a coda unwittingly addressed at the state prosecutor and local judges–Craig, as the felony judge, has been particularly keen on harsher rather than more lenient sentences, mirroring one of his predecessors in that seat, Raul Zambrano, now the chief judge of the circuit–Silano added this: “If we don;t change our sentencing guidelines or make departures from them on a more regular basis, they’re only coming back to us having received nothing at all in the prison system. Nothing good happens in there. Maybe nobody wants to talk about it, but I can get more drugs in prison than I can get on the streets. It’s the same thing.” He proposed a task force that would focus on the issue, with an eye on keeping inmates in their community as much as possible so when they’re done with their sentences, they’re not disconnected and they can more easily recover from their addiction. A related point was made from a different angle, a perspective rarely heard in the community at large: that of the state probation office. Sharon Davis, the regional supervisor of probation and parole for the state prison system, was as blunt as Silano: “This is our main focus at probation and parole,” she said. “Our biggest problem is substance abuse treatment and lack thereof. We recently got a contract with Hearthstone Fellowship and it’s been a great partnership with them with outpatient treatment.” That was made possible by a grant, which is not open-ended: it started only last year, when a single treatment class per week cost outpatients $30. Those classes are not helpful without continuity. And that’s after losing the Salvation Army’s facility, where addicts were sent until it closed because of Hurricane Irma. Davis too urged expanding the Drug Court program. Meanwhile in the trenches–at the deputy and police officer’s level, at the level of the paramedics on the street, the county jail–there are challenges there as well. Sheriff’s deputies just got delivery of narcan, which can stabilize and arrest the effects of an overdose, saving a life. Paramedics have been using it for years. Joe King, the assistant fire chief in Flagler, said it was administered 155 times in 2014 and 190 times last year. With addicts not responding to the usual dosage, the county just got approval to increase the amounts of narcan it administrers when faced with addicts. But the product, which is available over the counter for $136, has many more uses than just to stabilize addicts. Paramedics use it as one of their diagnostic tools for other issues. 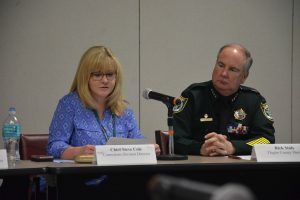 Once an individual is taken to jail, a new set of issues develop, as Jail Director Becky Quintieri described it: it’s not as if keeping inmates there to await an opening in Drug Court helps the bottom line. Protecting staff is a priority: fentanyl can be absorbed through the skin and trigger an overdose, so deputies wear gloves and masks even to open inmate mail. (Staly says cops elsewhere have overdosed from accidental exposure to fentanyl.) Drug addicts’ presence at the jail increases the number of ER tips and subsequent medical appointments.There are times when an inmate cannot be detoxed safely at the jail, so he or she must be sent to the hospital or to Stewart-Marchman, incurring additional costs for the jail. Heroin injections means more infections, more HIV and hepatitis. “Our pharmacy bills for the last year was in excess of $20,000 a month because of HIV and hepatitis,” Quintierei said. Addiction also exacerbates other health problems, from cardiac conditions to diabetes. Then there’s mental health. 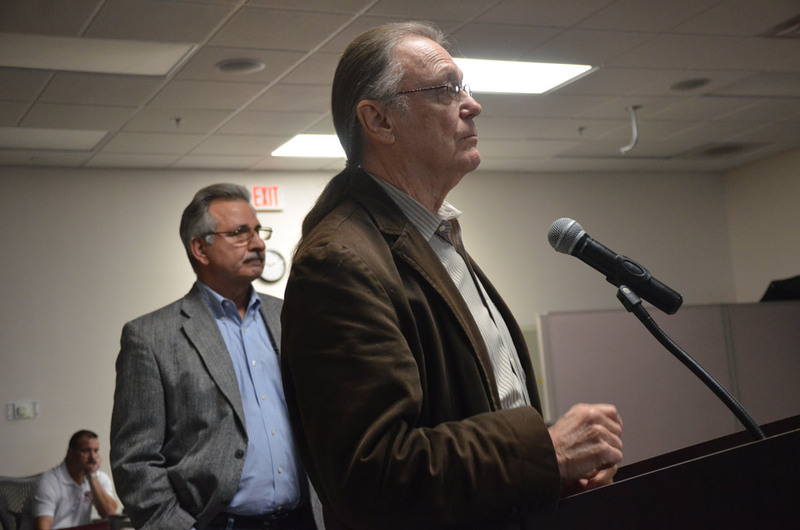 “We’re trying on our end to do the treatment that we can do with the jail but it is very costly for all of us,” Quintieri said. If a druggie chooses to enjoy drugs, I don’t appreciate having to have to pay for it, nor having our FCSO become non-medical attendants for them. They have made their choices. That is dreadful to our society. On the positive side, shareholders making money on it. The distributors and the manufacturers of the stuff doing good too. And just think…our concerned elected officials are more worried about texting while driving penalties which doensn’t impact near as many people, why, because giving a penalty generates revenue for them to be able to spend more money. Instead of money going to body cameras and like to have gadgets why not put that money towards a place to help those who need it. Instead of counties buying up environmentally sensitive lands (which are already protected) with tax money, do something to provide help to those who need it. And we are crazy enough to think we need medical marijuana??? It will only generate more fraud and crime. Everyone and their brother will be able to get it….why….because it too will generate revenue for the politicians to travel the country and world. It is sad that heads have been turned for so long knowing there is a drug problem in this country. Now that its out of control or leaders act like “what can we do” . They know providing a bed to a sick person does not generate revenue and that cramps their style. There is plenty of land right there on Old Kings Road not far from the hospital for a facility. The hospital here in Flagler is a joke, has had a terrible reputation for years, and they stay the same course-turn part of it into a facility since they transport so many other patients that come to them to other area hospitals. Drug addiction affects all of us and it is time we require our elected officials to give it priority attention and put plans and actions into place to help this country recover. The pharmaceuticals are to blame and they are getting away with murder and charging outrageous prices for medications. They need to be held accountable!!! It saddens me that people are so ignorant to this epidemic. If you have been blessed not to have an addict you know your lucky. This is not just killing our kids anymore its killing everyone there is no discrimination. Throwing people in prison does nothing because there is as much drugs in there so when they come out nothing has changed. These people did not set out to be addicts theyay have had an injury, mental issues. You want someone to blame then put it were it belongs the doctors who prescribe pills. Get these people help rehabs not prison or jail. People should watch the show intervention you will learn something. If you have a closed mind and think they belong in prison please take another look. Anonymous texting while driving probably kills more then opiods ,if not, it is up there on the list, please do not take away from a bill meant to save lives, also medical marijuana would help fight the opiod crisis, everyone and their brother already smokes pot, bought untaxed and untested from an illegal black market. Very hard time for opiate and synthetic drug dealers and distribution. Life or death penalties,get serious and real with the problem. I wish there is a Methadone Maintenance Clinic here in Palm Coast. Methadone eliminates the pain of withdrawals, eases the craving for the next fix, and takes care of the pain. Methadone is not a new or experimental drug. It’s time tested. We need to insert drug education in our schools. Maybe if the know the outcome, they won’t start in the first place. However, spending middle class tax money on treatment, police and court costs because someone decides to take illegal drugs is not something I’m a fan of. Why does our government put the cart before the horse. We do things in reverse. Denise, thank you. Unlike the other self-righteous judges on here, you show some common sense and compassion. ie. cancer, heart disease, etc. Real diseases that randomly attack, not drugs of choice. I would like to know the success rate of methadone, project warm, etc. Personal responsibility is a thing of the past. I feel no responsibility to support a junkie in any way.